The NCL script "skewt_func.ncl" is included with the NCL distribution. 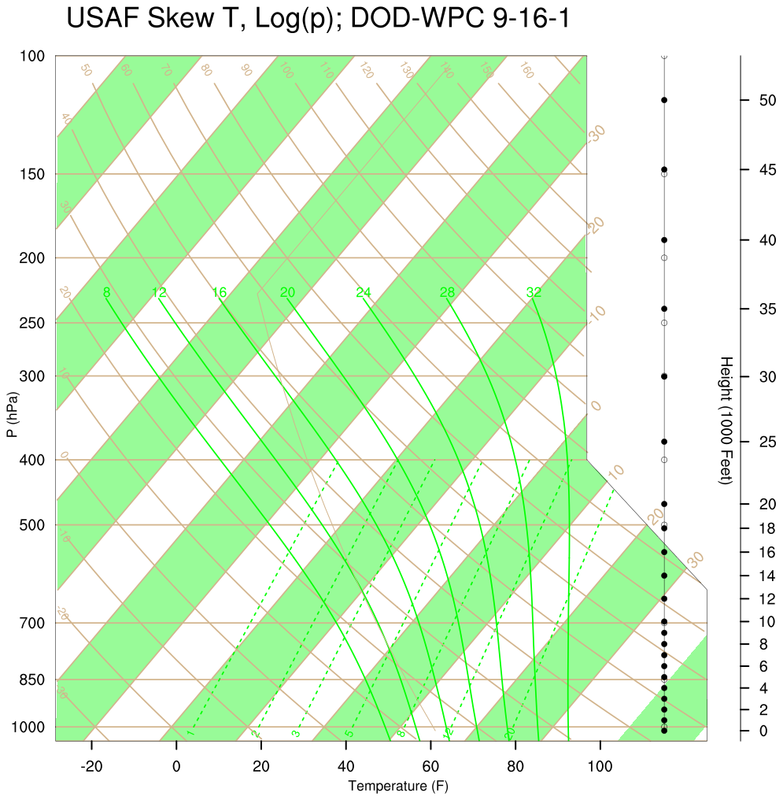 It is designed to reproduce the "USAF Skew-t, log p diagram (form dod-wpc 9-16-1)". 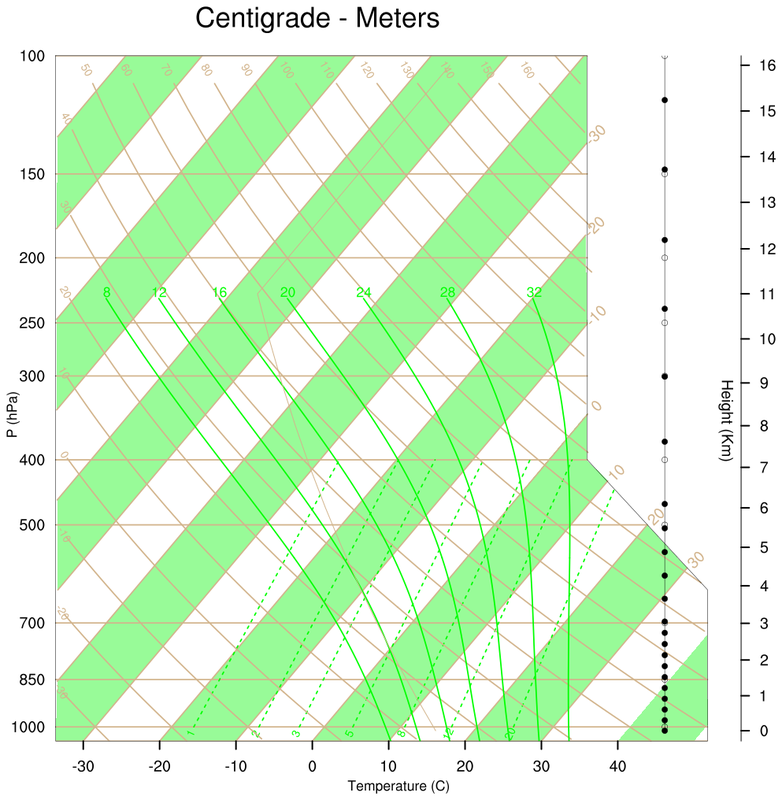 All wind directions/speeds or u-v components are assumed to reflect conventional meteorological conventions. Missing values, indicated by the _FillValue attribute, are allowed for any variable. The user may alter the default behavior of the "skewT_BackGround" and "skewT_PlotData" functions. dataOpts@colTemperature = "black"   ; default -> "Foreground"
dataOpts@colDewPt       = "green"   ; default -> "RoyalBlue"
dataOpts@colCape        = "orange"  ; default -> "Red"
dataOpts@colWindP       = "black"   ; default -> "Foreground"
dataOpts@colWindZ       = "black"   ; default -> "Foreground"
dataOpts@colWindH       = "black"   ; default -> "Foreground"
; wind speed (WSPD) and direction (WDIR). dataOpts@WspdWdir      = False      ; Set to False, if u and v are input. ;    wind report would be plotted. is returned as attributes of the returned graphic object. 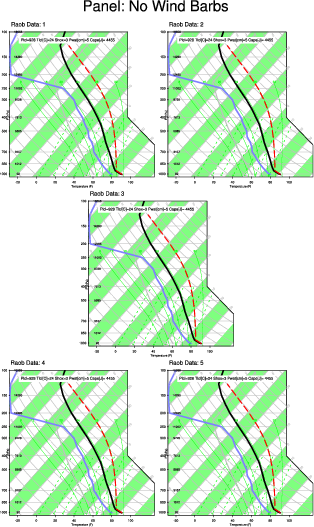 skewt_1.ncl: demonstrates the construction of three skew-T plot backgrounds. The left plot is the default. The center plot was created by setting the two attributes DrawColAreaFill and DrawHeightScale to "True". The third plot uses a centigrade scale [DrawFahrenheit = False] and the heights are indicated in meters [DrawHeightScale=True and DrawHeightScaleFt=False ]. 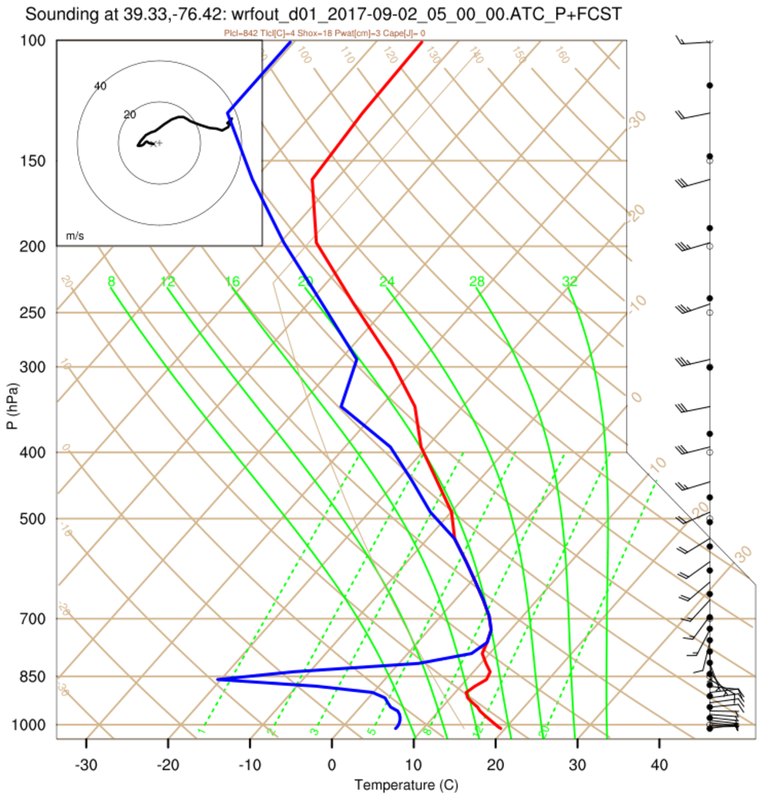 skewt_3.ncl: Plots sounding data. 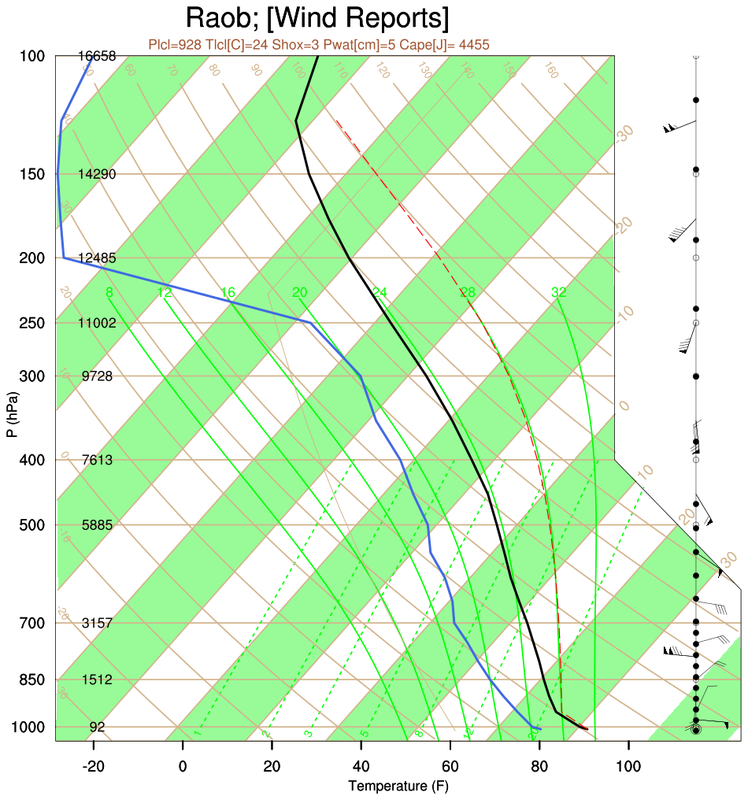 The left figure shows the full radiosonde while the right plot "thins" the number of wind barbs plotted and uses a Centigrade scale. Setting the Wthin attribute to 3 means plot every third wind barb. 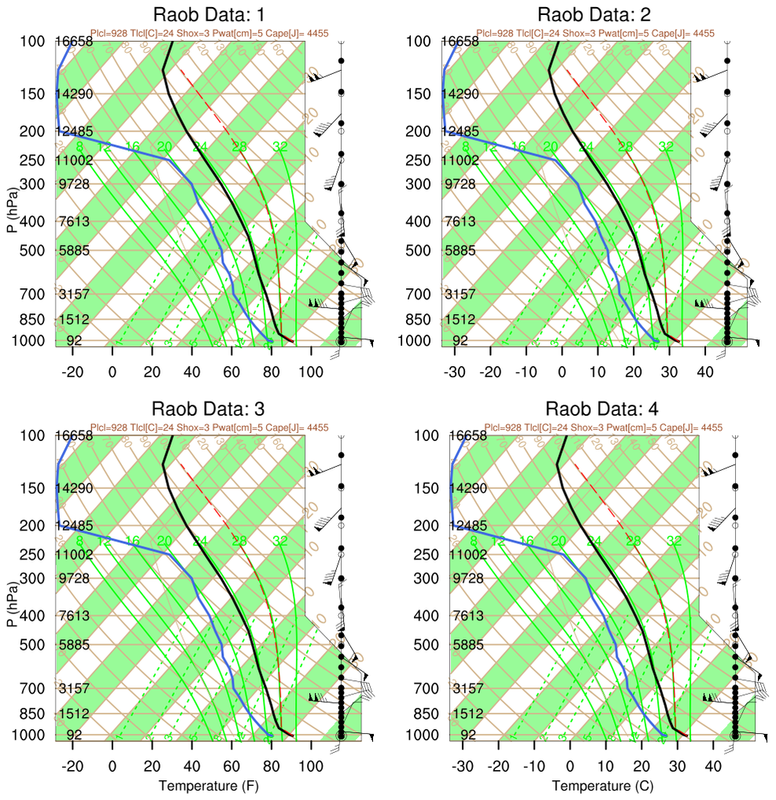 The variables plotted are: T [C], TD [C, dew point temperature], Z [m], WSPD and WDIR [knots or m/s; wind speed and direction]. The only required variable is P [mb; Pressure]. The required order is surface [ie, ground] to top. 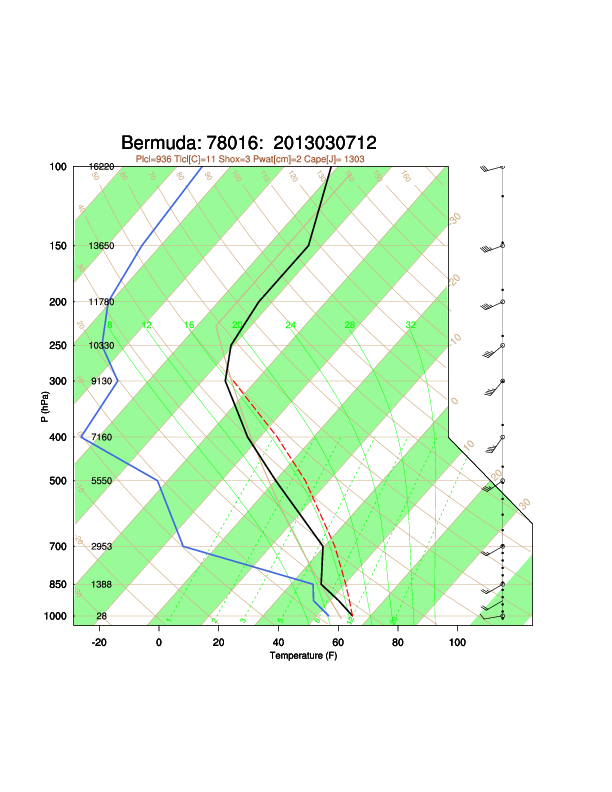 skewt_4.ncl: This shows how to plot two soundings on the same plot. 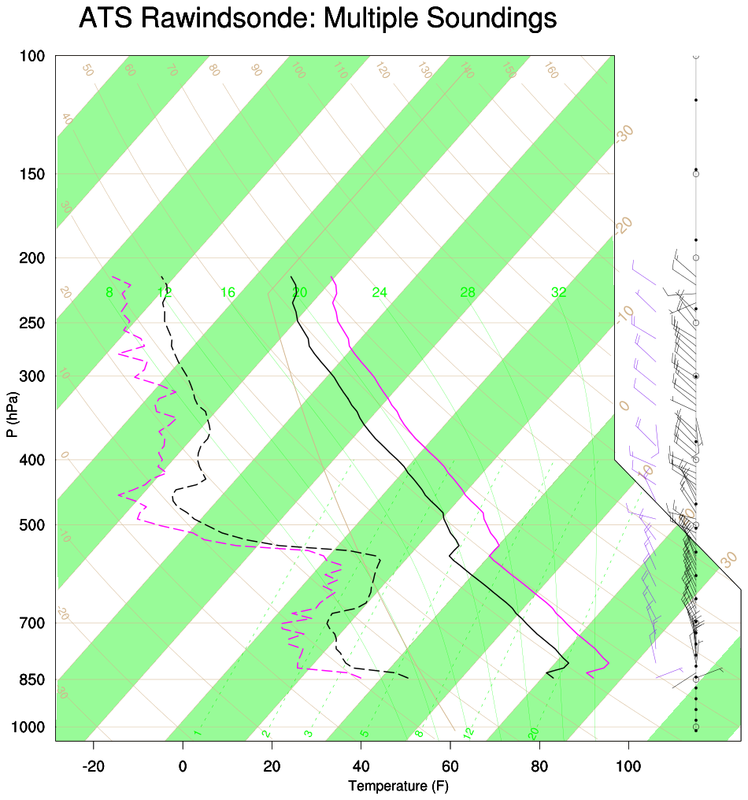 Basically, (a) draw the background; (b) draw each sounding upon the background; (c) advance the frame after all soundings have been plotted. Options are used to change colors, line patterns, location of wind barbs [xpWind] and to thin the number of wind barbs [Wthin]. The data file is here. skewt_5.ncl: Panel the skewT diagrams. This is done via the special "Panel" attribute which you set to True. This example just repeats the same plot for demonstrative purposes. 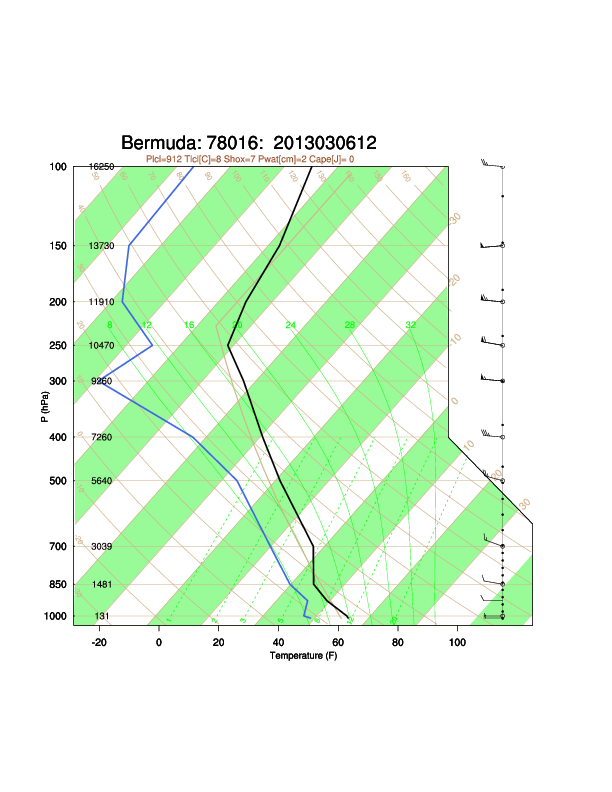 Unfortunately, at this time, The wmvect drawn wind barbs can not be paneled. The data file is here. skewt_6.ncl: Read a RUC (Rapid Update Cycle) GRIB file (here: ruc2anl). Plot the skewT at the grid point(s) nearest user specified locations. The getind_latlon2d function is used to find the nearest locations. DSS Example: NCAR's Data Support Section has created an which plots a skewT diagram with NCEP ADP Global Upper Air and Surface (PREPBUFR and NetCDF formats) Weather Observations. The keywords station_icao and station_synop should represent the same observing station. 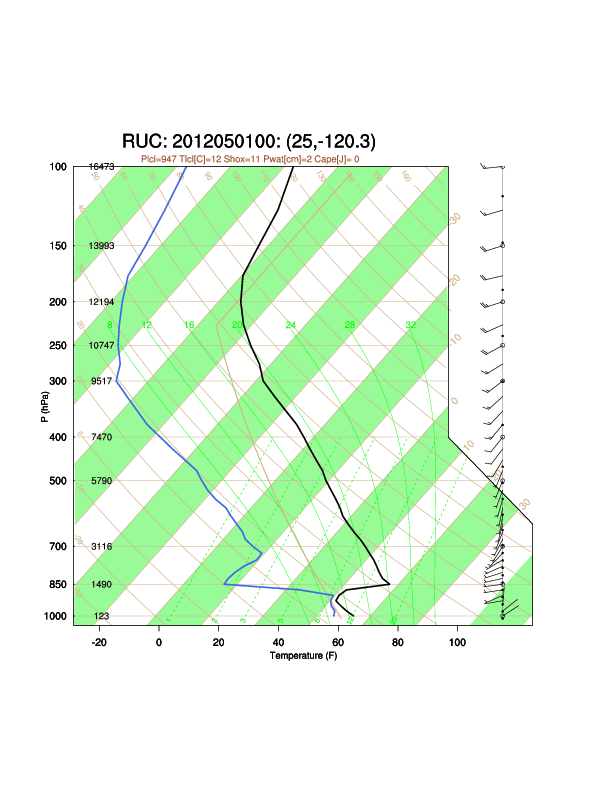 Thus, for Denver Stapleton, the values would be station_icao = KDNR and station_synop = 72469. 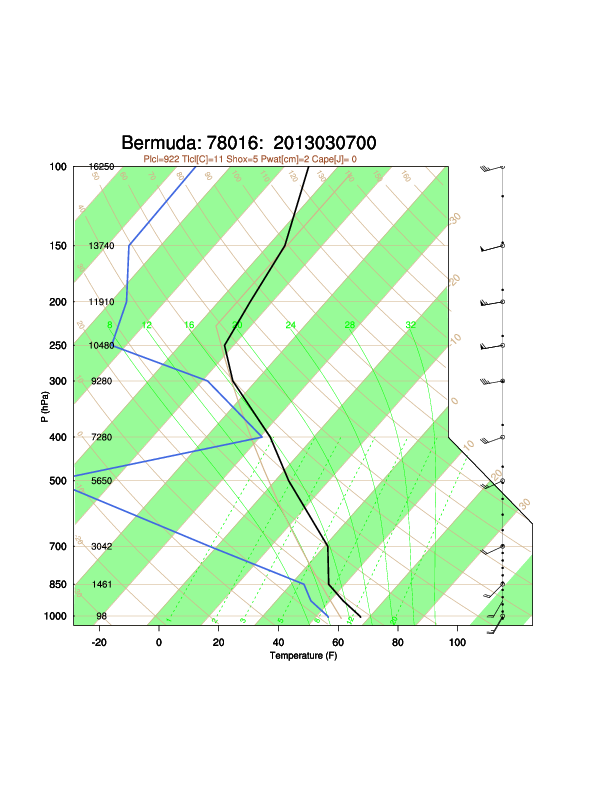 Since the program is plotting a skew-T log p diagram, the input NetCDF file should contain data from a valid synoptic observing station where radiosondes are launched, and that the input time is either 00 or 12Z (the synoptic times when radiosondes are launched). The script assumes the user knows this beforehand and make the appropriate selection. 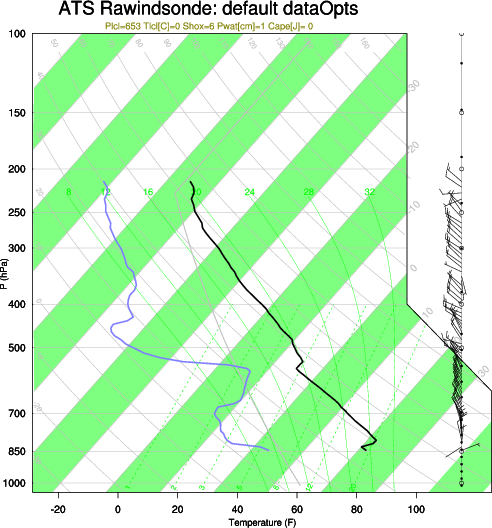 Since the program is plotting a skew-T log p diagram, the input NetCDF file should contain ADPUPA observational data from a valid synoptic observing station where radiosondes are launched, and that the input time is either 00 or 12Z (the synoptic times when radiosondes are launched). The DSS also provide IDL software to create a skewT. 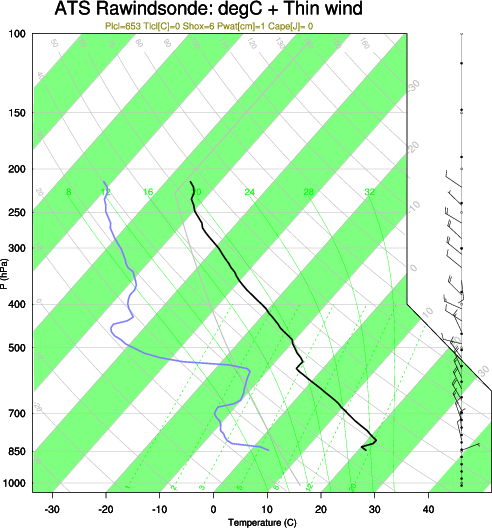 The script will also plot wind barbs for significant wind levels ('sigW') if there are any on the file. In this case, none were available. NOTE:  The units of the time variable ('synTime') contain parentheses. These are non-standard. The script assigns the correct units. The variable 'numSigW' has no attribute which indicates a missing value (ie, missing_value or _FillValue). The script assigns the appripriate _FillValue. A few other variables on the file have missing _FillValue attributes. skewt_8.ncl: Manually panel the skewT diagrams. 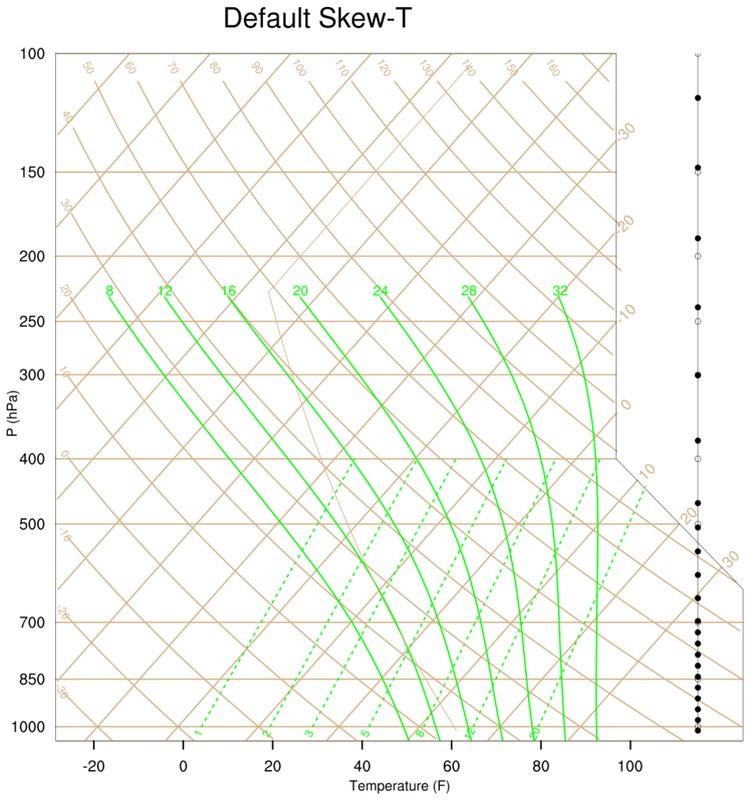 This allows the wind barbs to be drawn (See Example 5). For illustration the bottom (Temperature) and left axis (P) titles are turned off and on. The ascii (text) data file is here. 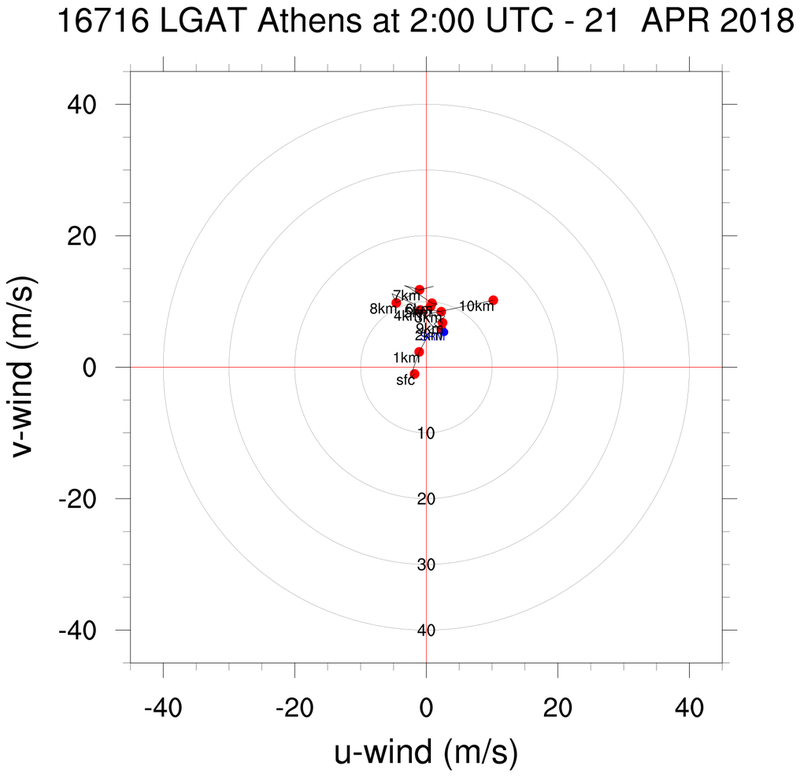 skewt_9.ncl: Use scripts donated by Stavros Dafis (National Observatory of Athens/IERSD, Greece; Polytechnic School of Paris, Laboratory of Dynamic Meteorology (LMD)) to create a hodograph and a skew-T onto which a number of derived quantities are printed. 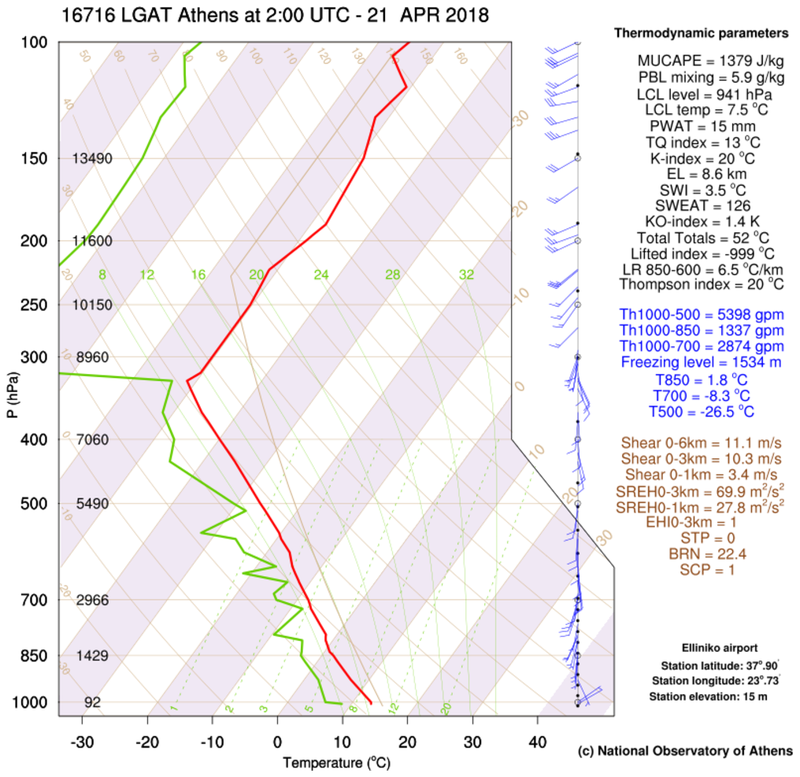 Click for scripts and data: skewt_func_dafis.ncl; hodograph_dafis.ncl; hodo_cartesian.ncl; Athens_latest.txt. 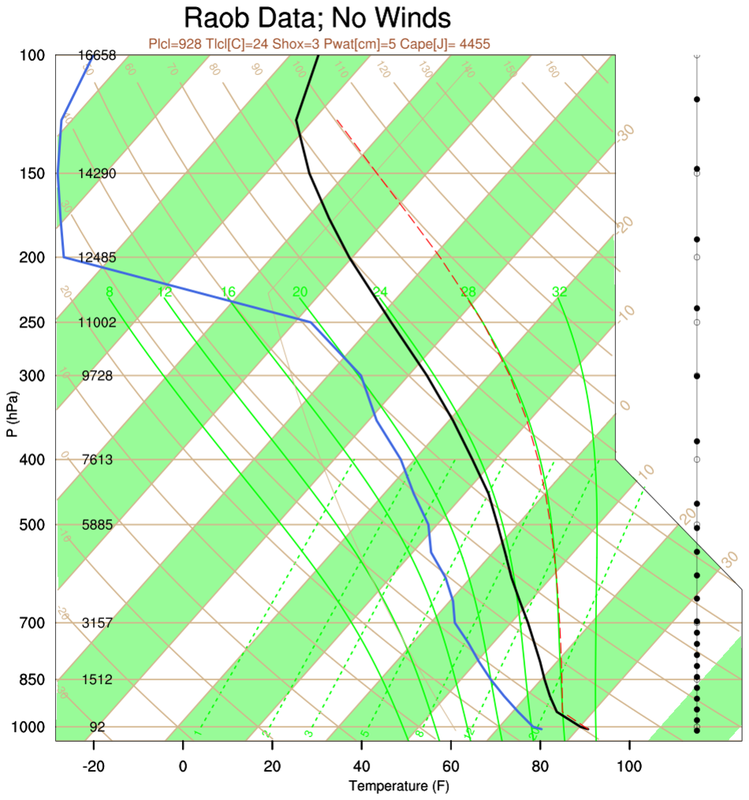 skewt_10.ncl: Use a script donated by Joe Grim (RAL; Aviation Applications Program) to create a single plot containing a hodograph superimposed onto skew-T. 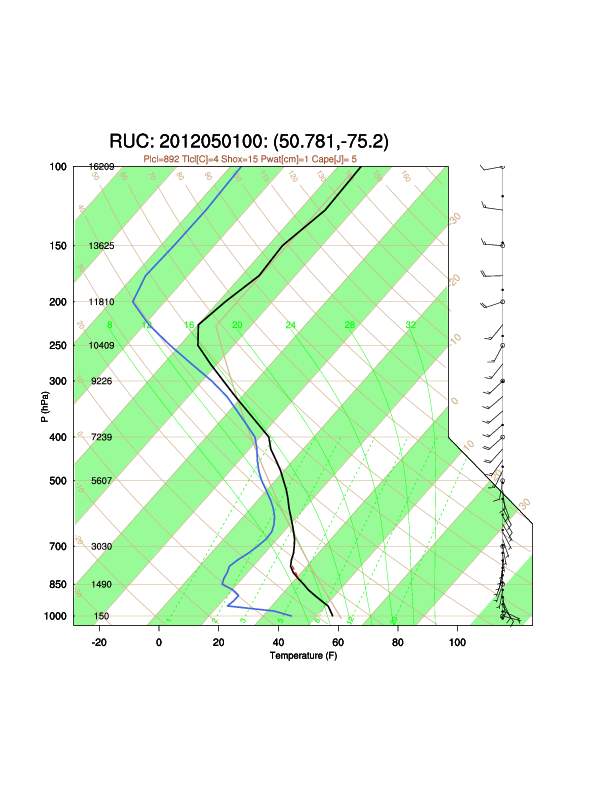 The 'sounding' values are extracted from a WRF netCDF file.